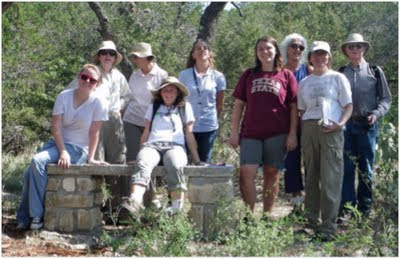 Friday, July 15th, a group of us walked Prospect Park-Purgatory Creek Natural Area in San Marcos to learn what we could do to improve the diversity of the natural area. Minnette Marr was our guide and we were given numerous ideas on how to encourage more wildlife to visit the greenspace. Removing some of the invasive ligustrum was also a key topic as we have the opportunity to receive assistance by Texas State students being involved with the local community. This is the third visit by San Marcos Greenbelt Alliance trail crew members and Master Naturalists in planning work in the natural area this year. See Lance’s follow up story here.